Beyblade Burst tops bring wild fun to the Beyblade Burst Avatar Attack Beystadium. Beyblade Burst tops can "burst" into pieces, resulting in 2 points for the other player (burst rates vary). Beyblade Burst Avatar Attack Battle Set tops' components included in this set are interchangeable with most Beyblade Burst tops except Beyblade Burst Rip Fire tops. 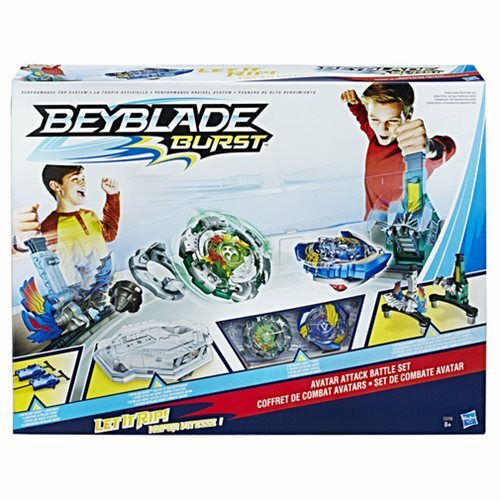 Avatar Attack Battle Set comes with 2 Avatar Attack Beystadium accessories and 2 Beyblade Burst tops [consisting of Valtryek V2 (aka Victory Valtryek) Energy Layer, D01 (aka Boost) Forge Disc, & TA06 (aka Variable) Performance Tip; Kerbeus K2 (aka King Kerbeus) Energy Layer, D04 (aka Limited) Forge Disc, & TD04 (aka Press) Performance Tip], 1 Beyblade Burst Avatar Attack Beystadium, and 2 Beyblade Burst launchers. Scan code on Beyblade Burst Energy Layers to unleash them in the Beyblade Burst app. Let it rip! Only use Beyblade Burst tops with a Beyblade Burst Beystadium.